An attempt to summon the ghost of Cubs broadcaster ended in the deaths of five occultists. Onyx, the seventeen-year-old sole survivor of the attempted summoning, said Harry Caray killed his friends. Onyx, whose real name has not been released by the Chicago Police, said they were just trying to help the Cubs. "We aren't that into baseball." Said Onyx, "but we just felt so sorry for the Cubs. They are so cursed that it's no longer funny. Since our coven was dedicated to helping people, we decided to help the Cubs." Onyx said that they felt the best way to help the Cubs win their first round playoff series was to summon the ghost of Harry Caray. "I sort of remember him, but my parents said he was really popular. So we figured that he must have all this spiritual energy from being so popular. If we could just get him back into the living world, he could use his powers to help the Cubs. Also my brother, who has this book called Wraith, said that Harry should have low levels of angst, so he wouldn't flip out on us. I figured he knew what he was talking about." The coven attempted to summon Caray on Wednesday behind the Cubby Bear bar. Onyx claims that Caray appeared to them a giant glowing disembodied head with glowing eyes. Before they could talk, Caray, according to Onyx, said, "Yum! More souls!" Five beams shot from his head. The beams sucked the souls out Onyx's coven members. "Souls taste better than Budweiser!" Caray said, according to Onyx. Cary than stared at Onyx and said, "Tell all the Cubs fans around the world about me young man. Tell them to come to me after they die so they can become one with me and help me take over the Chicago Shadowlands! Though me, they will exist forever!" John Gould, a Chicago resident, claims to have seen Onyx with the ghost of Caray. "I was taking my daughter to game one of the playoffs, when I heard someone screaming. So we ran behind the Cubby Bear. It was terrible. 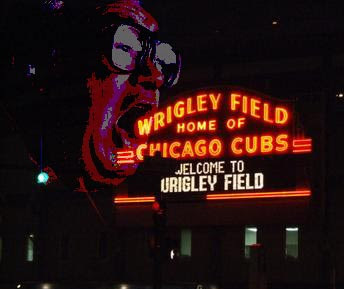 I saw the floating head of Harry Caray, along with the bodies of five teens in robes. The robes had symbols on them, you know, like you see in those horror movies. Plus they had the Cubs logo on them. Weird. Anyway, Harry was hovering over the robed guy that was still alive. The robed guy was crying like a baby. Then Harry looked at us. He said, I'll never forget this, 'Hey little girl, I'd love to meet you after you die! I'll bet your soul will still taste sweet!' We ran away. Now my daughter is deathly afraid of the Cubs! I think we're going to become Sox fans." Occult experts are divided over how to interpret this incident. "The living just don't want to consider how the afterlife can change a soul." Said Mike Clarke of Downers Grove Psychics. "Sure when Harry died he was a broadcaster who loved the Cubs. This incident suggests that he's now interested in overthrowing Mayor Daley Senior's ghost political machine. This is why communication with the dead should only be facilitated through a professional psychic." Ellen Archer, who has spoken with Chicago's ghosts for 15 years, doubts Onyx really dealt with Caray. "Harry Caray was surrounded by so much love when he died that I know he transcended to the next level. While he still exists, he exists in the distant dimension of the afterlife. A dimension that only exceptional psychics like myself can reach. We may cost more than your average psychic, but we get results!" Onyx is being held by the Chicago Police and will be charged with the murder of his coven members. His lawyer said Onyx is being framed in order to protect the public image of Harry Caray.